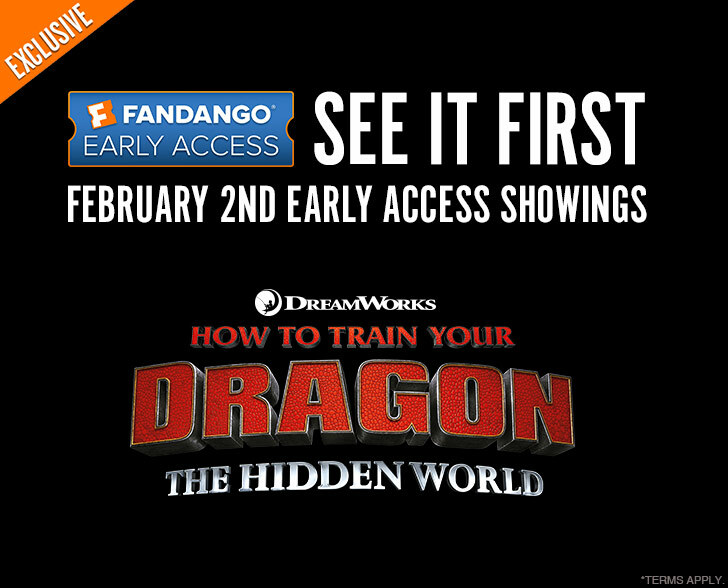 Los Angeles (January 14, 2019) – Fandango, the leading digital network for all things movies, is teaming up with DreamWorks Animation to offer exclusive early access screenings on February 2 of “How to Train Your Dragon: The Hidden World,” the third chapter of one of the most beloved animated franchises of all time. Tickets for this limited engagement go on sale today, exclusively for Fandango. Nearly three weeks before the film’s February 22 U.S. theatrical release date, fans and members of Fandango VIP, Fandango’s free-to-join rewards program, can get a first look at the film through exclusive Fandango early access screenings taking place at select AMC Theatres, Regal Cinemas, Cinemark Theatres, Marcus Theatres, Harkins Theatres, Southern Theatres, National Amusements, B & B Theatres, and many more. Approximately one thousand theaters and forty exhibition circuits nationwide are participating in Fandango’s exclusive early access screenings. These screenings are among the earliest advance nationwide screenings of a highly anticipated movie from a major studio. Fandango VIP members who purchase tickets for the early access screenings will not only be the first to see the film, but they will also get a free DreamWorks Animation movie to stream at home through FandangoNOW, Fandango’s video streaming service. Voted in a recent Fandango survey by more than 3,500 film fans as one of the most anticipated animated movies of 2019, “How to Train Your Dragon: The Hidden World” is directed by Dean DeBlois, who has directed and co-written every film in the series. In this third chapter of the epic adventure about the unlikely friendship between a Viking boy and his dragon, Hiccup (Jay Baruchel), Astrid (America Ferrera), and Night Fury dragon Toothless discover a hidden world of dragons thought only to exist in myth. Fandango has a long tradition of working with the studios and filmmakers on programs to surprise and delight moviegoers, and this is the first of multiple early access screenings Fandango is planning for 2019. For every movie ticket purchased on Fandango, Fandango VIP members also receive 125 Points. Once members reach 500 Points, they will receive a five-dollar reward that can be used for more movies – either for future movie-ticket purchases or for digital-movie purchases and rentals on FandangoNOW. In addition to earning points on Fandango, Fandango VIP members can also link their other theater rewards cards, including AMC Stubs, Cinemark Connections, Regal Crown Club and others, for even more benefits. Tickets for the film’s February 22 wide release go on sale on Fandango this Friday, January 18. Fandango is the ultimate digital network for all things movies, serving more than 60 million unique visitors per month, according to comScore, with best-in-class movie information, ticketing to 30,000 U.S. screens, trailers and original video, home entertainment and fan merchandise. Its portfolio features leading online ticketers Fandango, MovieTickets.com and Flixster; world-renown movie review site Rotten Tomatoes; and Movieclips, the #1 movie trailers and content channel on YouTube. Fandango’s movie discovery and ticketing innovations can also be found on mobile, social, AI and voice platforms from Apple, Facebook, Google, Amazon, and others. Fandango’s video on-demand service, FandangoNOW offers new release and catalog movies and next-day TV shows to more than 200 million connected, over-the-top (OTT) and mobile devices, while Fandango FanShop curates unique and exclusive fan gear and collectibles. In Latin America, the company operates leading online ticketers Ingresso.com and Fandango Latin America. Now chief and ruler of Berk alongside Astrid, Hiccup has created a gloriously chaotic dragon utopia. When the sudden appearance of a female Light Fury coincides with the darkest threat their village has ever faced, Hiccup and Toothless must leave the only home they’ve known and journey to a hidden world thought only to exist in myth. As their true destines are revealed, dragon and rider will fight together-to the very ends of the Earth-to protect everything they’ve grown to treasure.